Midweek games are something of a rarity these days, so it seemed odd to be slipping out of work to head for Vicarage Road. As I approached the West Herts, I bumped into Don and Trond, who were already on their way to the ground. I know that they usually leave pretty early, but there were a number of other people also heading in the opposite direction to me, so I became a little concerned that I had made a mistake regarding the kick-off time. Thankfully the bar was still busy and our usual table was populated with friendly faces. There was a surprise appearance by Chris and Carl Todd. So lovely to see them and even better that there was a spare ticket available among our group allowing Chris to see the game live rather than watching the television in the bar. Team news was that Silva had made one change from the team that started at Newcastle, with Prödl replacing the injured Britos in defence. So, the starting line-up was Gomes; Mariappa, Prödl, Kabasele; Femenía, Cleverley, Doucouré, Zeegelaar; Hughes, Richarlison; Gray. Former Watford youngster, Ashley Young, started for the visitors and his name was cheered as it was announced. It all started so well. The Hornets had an early chance as Femenía hit a cross that Richarlison was just unable to reach. The Brazilian was the next to try a cross, but it was caught by De Gea. A corner from Cleverley was met by the head of Zeegelaar, but the effort was blocked. Somewhat against the run of play, the visitors took the lead in the 19th minute with a gorgeous shot from Young that curled in at the near post. He celebrated in front of the Watford fans, which incurred the wrath of many in the Rookery meaning that his every touch was booed from that moment on. The first booking of the evening went to Doucouré after a tackle on Pogba. Young scored a second after 25 minutes with a stunning free kick which flew over the wall and under the crossbar before Gomes saw it. This time he celebrated by sliding on his knees towards the Rookery. Now I am not one of those who believes that returning players should not celebrate, but I thought this celebration was a bit rude. There is no need to goad the opposition fans and it would have been more enjoyable for both sets of fans if he had celebrated facing the away end. The visitors scored their third after both Kabasele and Prödl failed to clear when given the opportunity, allowing Lukaku to feed Martial who had an easy finish. Gomes saved Watford’s blushes, preventing a fourth goal, as he parried Lukaku’s shot from the edge of the area, Lingard looked sure to score from the follow-up and Gomes did well to tip the shot over the bar. In time added on at the end of the half, there was finally something to make the Watford fans smile as Femenía went on a run across the pitch and into the box where he crossed for Richarlison whose header hit the bar and flew over the target. 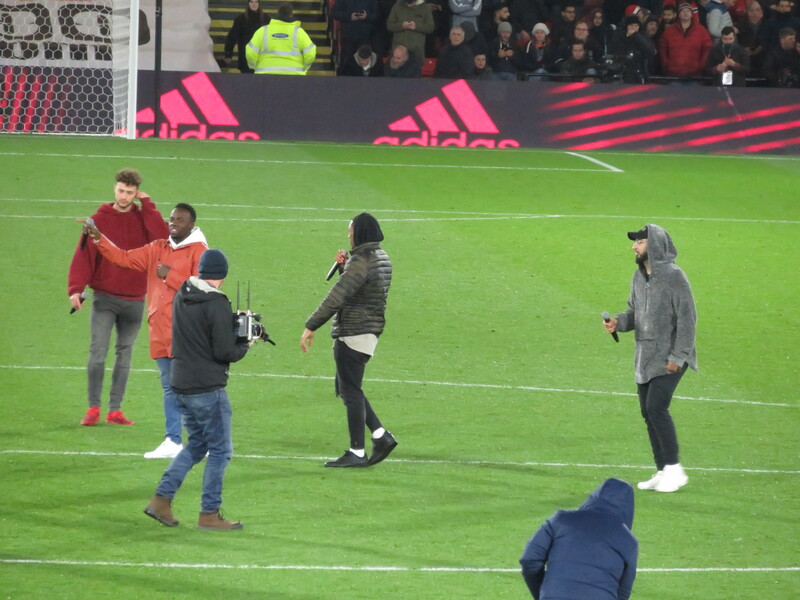 The half-time entertainment was a visit by X-factor finalists, Rak-Su, a band of Watford lads. It probably wasn’t the best evening for them to be appearing as the Watford crowd were not in the best of moods by this point. They did their best to lift spirits, but were fighting a losing battle. I was not looking forward to the teams returning after the break, but the Hornets started brightly as Cleverley tried a cross which was too close to De Gea. At the other end, Martial found Lukaku who shot wide of the far post. 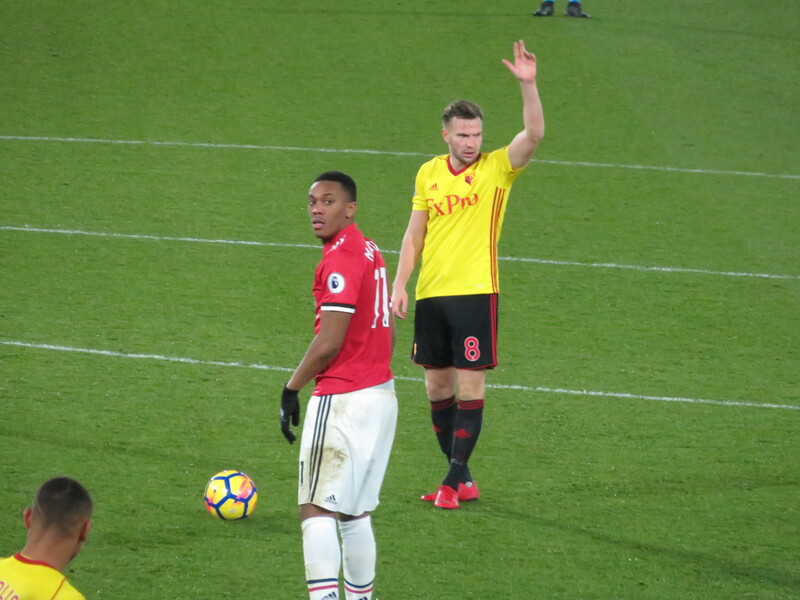 Each side was forced to make a substitution early in the half with Herrera coming on for the injured Matic for the visitors, while Pereyra and Carrillo replaced Prödl and Hughes, who appeared to have a strain, for the home side. Watford threatened with a shot from distance from Doucouré that flew over the bar. The Hornets came even closer to pulling one back when a lovely cross from Femenía was met by Richarlison whose header was just wide of the near post. United’s second change saw Rashford come on for Martial. The visitors had a chance to increase their lead as Pogba met a corner from Lingard, but Gomes dropped to make the save. Carrillo did really well to turn and lose his marker on the edge of the box, he put in a decent cross, but no Watford player could apply the finishing touch. Then a Zeegelaar cross flew over the head of Richarlison, the clearance fell to Mariappa who tried a shot from distance that flew wide of the near post. 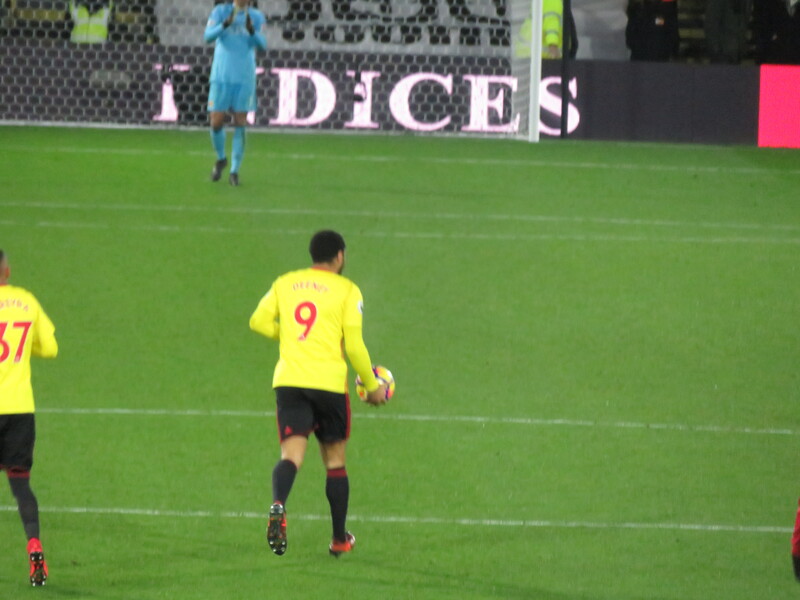 Silva’s final change was to bring Deeney on for Gray. The captain took the field to a massive roar from the Vicarage Road faithful. He had an early chance to make an impression as a cross from Doucouré came his way, but the defender stopped him making a clean connection. The visitors had a further chance to increase their lead as a free-kick from Lingard was met by Pogba, but his header was just over the bar. A couple of chances then fell to Lukaku, the first was blocked by Mariappa, the second flew wide of the far post. Watford got a goal back on 77 minutes after Rojo tripped Pereyra in the box. The United players surrounded the referee, but he had already pointed to the spot. Deeney stepped up with a smile on his face. The guy next to me couldn’t look, so missed seeing Troy kiss the ball before placing it on the spot and burying it in the left-hand corner after sending De Gea the wrong way. At last, something to cheer for the fans of the Hornets. The Watford captain had a chance to score a second as Femenía delivered a lovely cross that Troy headed goalwards, but it was caught by De Gea. 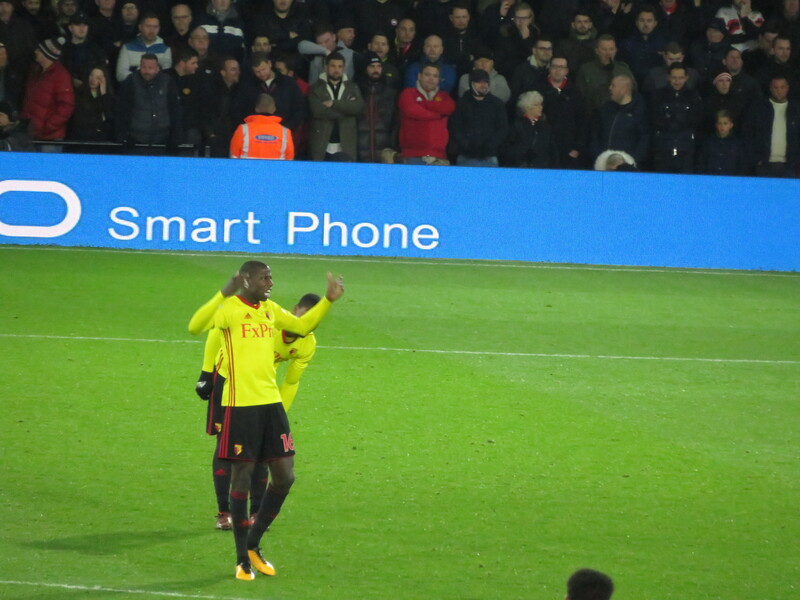 The second Watford goal was a thing of beauty as Carrillo crossed for Doucouré to hit a terrific shot past De Gea. Suddenly it was game on and the Watford crowd were roaring their encouragement. Richarlison had a chance for an equalizer, but his close range shot was blocked at the near post. Then United broke down field and Lingard dribbled half the length of the pitch. With the Watford defence arrayed in front of him, I was willing one of them to stop him, but no tackle came and he beat Gomes to give the visitors a two goal cushion. 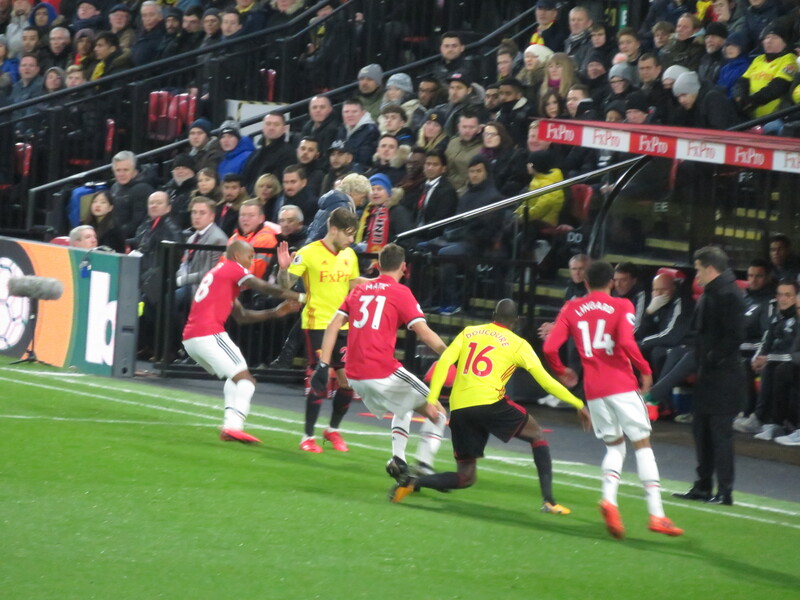 Despite the set-back, Watford were still battling to get something from the game as Richarlison crossed from the byline but De Gea put the ball out for a corner, from which Cleverley’s delivery was headed clear by Pogba. There was a roar from the home crowd as the fourth official indicated that there were 4 additional minutes, but it was in vain and the game finished in defeat, but with the Watford team applauded off the pitch. It was an odd game. The first half had been brutal. Watford had not been overrun as far as possession was concerned, but each misplaced pass seemed to be punished. It has to be said that Young’s goals were both excellent, but I was pretty miserable at the end of the half. But the Watford team showed great resilience with a considerably better performance in the second half. The introduction of Carrillo made a difference, he was excellent. Deeney also contributed to the upturn, his strength is always an asset and he certainly added a new dimension to the game. When Doucouré’s goal went in, there was a definite feeling that we could get something from the game, something that would have seemed impossible at half time. The defeat was disappointing but, before the game, we had this one down as a free hit and I enjoyed the comment of one of the lads behind me that, having already won 4 points from games against Liverpool and Arsenal, that would do for him. We host Tottenham on Saturday, which won’t be any easier, but can also be considered a free hit before we have a series of games against those around us in the table. Our points total in December will give a very good signal of whether this team is as good as we think it is. With 21 points already on the board, a relegation battle is looking unlikely, so I hope that we can continue to look up the table and enjoy the football. That would make me very happy indeed. This entry was posted in Watford FC and tagged Abdoulaye Doucoure, Adrian Mariappa, Ander Herrera, Andre Carrillo, Andre Gray, Anthony Martial, Antonio Valencia, Ashley Young, Chris Smalling, Christian Kabasele, David de Gea, Heurelho Gomes, Jesse Lingard, Jose Mourinho, Kiko Femenia, Manchester United FC, Marco Silva, Marcos Rojo, Marcus Rashford, Marvin Zeegelaar, Nemanja Matic, Paul Pogba, Richarlison, Roberto Pereyra, Romelu Lukaku, Sebastian Prodl, Tom Cleverley, Troy Deeney, Victor Lindelof, Watford FC, Will Hughes, Zlatan Ibrahimovic on November 30, 2017 by franelynn.